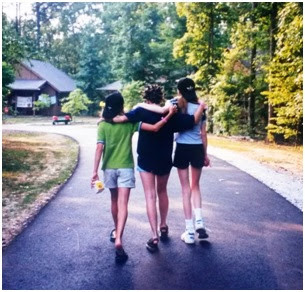 I created some of my most precious memories at camp, but it has also been the source of much heartache. In the above photo, we were walking back to the cabin after dinner. I’m holding a carton of chocolate milk, Ashley has her hair in little twists, and Teresa is wearing a backward adidas hat that so nicely complements my Nike hat. I can’t imagine what we were discussing, but I can assure you that we were carefree and laughing because that was what camp was about. Now, as I look at this photo, I wonder what made me the lucky one. We were all on the same path, yet at some point our paths veered in different directions. Teresa, on the right, died in August 2004 at age 20. I was moving into my college dorm that weekend, and, as I entered this new life chapter, the first phone call I received was to inform me of her death. I was devastated. It didn’t feel right to be starting a new chapter as her book closed. Ashley, in the middle, died in August 2005, also at age 20. I was at the school where my mom taught, helping set up her kindergarten classroom; I was drawing a child-sized kitchen at the time. My brother called a few times, but we couldn’t get service in her classroom. My mom went down the hall to call him back, and the moment she stepped in the room, I knew. I felt it in my heart the night before as I browsed through memories in my childhood room, taking a long pause while looking at a coffee mug brandished with our photo. When my mom told me that Ashley's dad had called, I felt like the world stopped turning. I was inconsolable for days. The next year, I turned 20 and nothing happened to me. The years kept coming, and I kept waiting, yet nothing happened. Although it is great to defy the odds, there is a part of me that deals with a tremendous amount of survivor’s guilt. Teresa and Ashley are just a few of the countless friends I have lost along the way. Some days I wonder why not me. What have I done to deserve such a longer life? Sometimes, when I see this picture, I feel an overwhelming sense of pressure to live the lives that they didn’t. Some days, when I’m feeling particularly down or anxious, I know that it’s unreasonable to carry such guilt with me — but on certain days I simply can’t help it. The best way I can think to help is by preventing similar deaths from happening. The reality is that things change quickly, and I never really know when my health will take a turn. I try not to get too far ahead of myself, but the only thing that keeps me grounded is believing that I will live to see a cure. I often hear people saying there aren’t enough hours in a day, and I couldn’t agree more. All we really want is to add more time — for me, for others fighting the same disease, and of course in memory of the friends who never got that. For now, this picture is just a memory. It’s a memory that stirs up every imaginable emotion. But it’s also a memory that gives me the drive to carry on — to make a difference – to keep walking the path.